I was approached by a lady (online and not as dodgy as it sounds) who works for a cancer charity ( http://www.mesothelioma.com please check it out!) in America by the name of Emily Walsh. She is trying to raise awareness about asbestosis or mesothelioma as it’s otherwise known. I didn’t realise this but in the United States asbestos is still a legal building material, even though they know the risks, just because it’s cheap for the building companies to use. I find this bizarre. In my opinion cancers fall into three categories, unexplained/unpreventable, partially preventable and wholly unnecessary. My cancer’s origin is unknown and at the moment there is no known reason for it to develop. This would fall into the first category (for now, until they work out why it happens). You also have a higher chance of developing cancer if you have a heavy diet of fatty food or if you don’t do any exercise. This is partially preventable in that some people have the luxury to vary their diet or introduce exercise into their life. Some don’t. If you have no source of income you can’t be picky about the food you eat. In America the cheapest food is junk, so there’s little choice, especially if you are working all the hours you can to pay the bills, raise your children etc. Also education can often fail on this point as the marketing departments for chain food restaurants with their glossy products easily outfox the government’s anaemic paperwork hand outs. Likewise sometimes people can’t do exercise. They either have bad backs, muscle issues or a weak heart. It’s then not practical to do exercise and there is little that can be done to prevent sedentary cancers. Other times people can do exercise but choose not to and this is then a lifestyle choice and preventable. It’s all down to context. The third type of cancer is the most criminal. This is where all evidence points towards something which is voluntary causing cancer, other options for this item are as cost effective which don’t cause it but its still used. Consequentially people die for no good reason. Using asbestos as a building material falls into this category. American legislative bodies know the risks and know that supply of this material is completely banned in other countries (UK, Singapore, Japan, and Turkey to name a few) as carcinogenic. There are alternatives which can easily be used. But companies still use a building material which causes a particularly horrible form of cancer. That’s just criminal. To explain a little more about asbestos I turn to our good friend Wikipedia. Individual asbestos fibres are invisible to the unaided human eye and when sufficient force is applied, they tend to break along their weakest directions, resulting in one larger asbestos fibre ultimately become the source of hundreds of much thinner and smaller fibres. When fibres or asbestos structures from asbestos containing materials (ACM) become airborne, the process is called primary release. Primary release mechanisms include abrasion, impaction, fallout, air erosion, vibration, and fire damage. Secondary release occurs when settled asbestos fibres and structures are suspended as a result of human activities. In unoccupied buildings or during unoccupied periods, fibre release typically occurs by fallout or is induced by vibration or air erosion. I digressed slightly there, but I think it’s relevant. 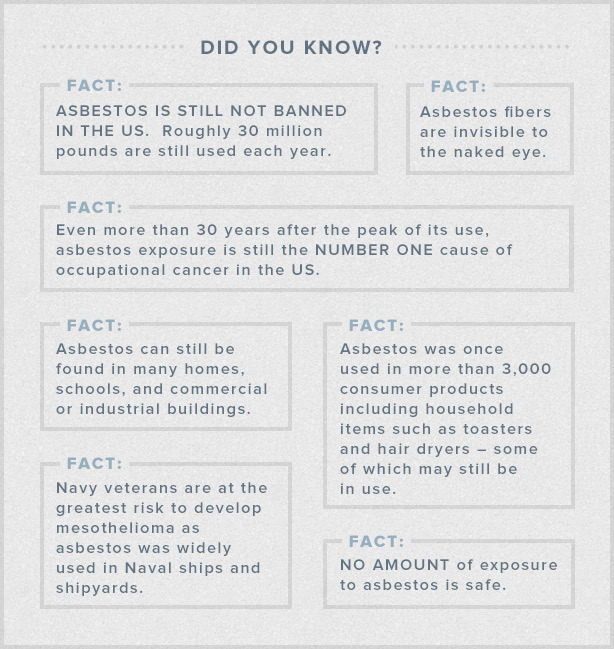 Like smoking, asbestos is completely unnecessary. With timber frame, brick and even corrugated metal you can make perfectly comfortable homes without having to put the Spector of mesothelioma (Or asbestosis) in the air. It’s just another example of companies seeking to get money whilst riding roughshod over people’s health. People need houses, couldn’t we make sure that they are made of material that doesn’t give them cancer? It’s true. Here, a former co-worker is currently dying of Mesothelioma caused by asbestos in his home. There are kits sold to test for asbestos & other relatively common poisons, like led; it’s common knowledge that it’s bad stuff. In terms of exercise, there is lots of heavy lifting at work, but the guy was obese with poor diet as your post noted, which is common in West Virginia. Processed foods remain edible longer and are more affordable. Costly healthcare, cheaper crap foods, and few jobs offering better wages or health/life/etc. benefits seem to contribute. OoOoh! On another creepy note, I’ve been told that the hospitals are breeding grounds for staph, and was informed of another co-worker and an old friend being infected with it at hospitals nearby within the past two weeks. I’m not sure if it’s similar there… It could be worse, I guess. I could personally do with less cigarettes… Great post! Research has been underway because 1971 when the president from the USA declared war on cancer and allocated funds to locate a cure. Nevertheless 40 years have now pasted and the best they have come up with is really a range of drugs which are marginally much more efficient but nonetheless do not remedy but may give somebody a little more time. These drugs are extremely costly costing around 4000 US dollars a month and one of them, herceptin utilized to get a type of breast cancer was stated to become 0.6 much better than a few of the earlier drugs.